Standard plan: 50 users can access business tools. Bitrix24 Professional plan subscribers have NO limitation for the business tools. For more details please see our prices page. In order to give all users the possibility to test business tools, activate free 30 days trial of Bitrix24 Professional plan under Subscription > Activate Trial. Bitrix24 communication tools are available to unlimited number of users. You can invite any number of users to your Bitrix24, they will be able to use Activity Stream messages, chats, mobile app - for free. Bitrix24 users with administrative access only can configure business tools users. First 12 users who accepted invitations to your Free plan Bitrix24 after registration are automatically granted with free access to the business tools. If you have activated demo version and then went back to the Free plan - the first 12 users you have invited to the account will keep access to business tools by default, but business tools users can be changed by account administrator at any time later. Bitrix24 account administrators have special section under Subscription > Business tools, where they can manage users access. For example, when one user is dismissed & a new one is hired to replace him; or when users who have been granted business tools access by default should be replaced. Use "delete" & "add employee" tabs to edit user list. Important: business tools user list can be updated only once a day! - dismissed users: some of them may have business tools connected by default. Solution: hire the user back, delete business tools access, dismiss back. - invited inactive users: these are users whom you've sent the invitation to & they have been granted business tools access by default, but due to some reasons these users haven't accepted your invitation yet. Solution: either force these users to accept your invitation or delete them from invited under Company > Employees. 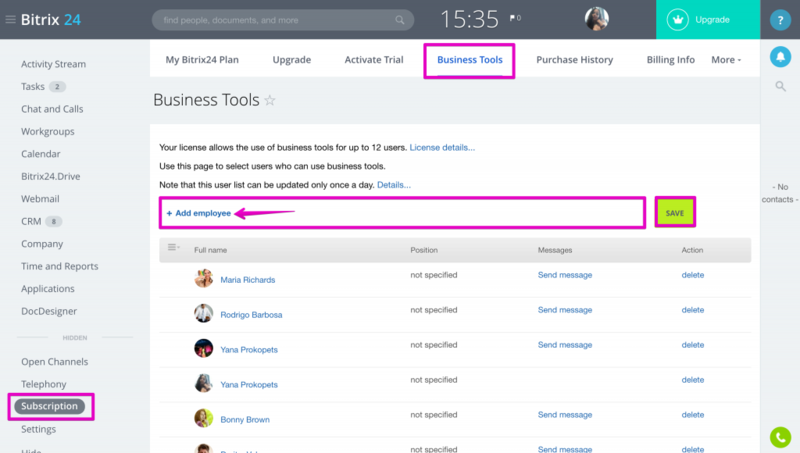 Important: Business tools page displays only active Bitrix24 users, dismissed or invited users with business tools access won't be shown there.